A few months ago I announced that I would be a judge for the Aestas 2014 literary competition (aestas is Latin for summer), hosted by what once was the e-zine Quill & Ink and now is reborn in the guise of Fabula Press. 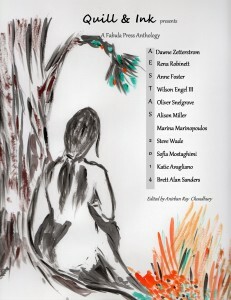 The judging of the summer contest has been complete for some time and the print anthology is finally available for purchase at amazon.com. It contains the ten long-listed submissions and a “bonus story” by yours truly. The beautiful art by Anisha Bhaduri and design by lead editor Anirban Ray Choudhury make it a pleasure just to hold in your hands, though undoubtedly you will want to look inside at the varied content. This anthology is an international effort, which to me makes it all the more appealing. Directed from India and Hong Kong, as is stated on the book’s back cover, it assembles a cast of writers from Canada, Sweden, England, Greece, the U.S., France, Australia, and Ireland. This internationalism, representative of what some of us like to think of as a global village, is one thing that I particularly enjoyed about the Quill & Ink. For this project, which continues now with the winter-themed anthology Nivalis 2015 (the Latin nivalis evokes snow in all its various contexts, literal and metaphorical), I hope to see an even broader cast of writers and protagonists with scenes and narratives from Asia, Africa, the Middle East, and Latin America, not to mention a more varied racial mix from the United States and Europe. As for my story, “Tribunal,” I am grateful to editor Anirban Choudhury, who published it online in the Quill & Ink in 2006 and now brings it to a wider audience in print. His enthusiasm for this story is encouraging and validating in a profession of literature which is otherwise mostly filled with rejection. I have lost track of how many drafts this one went through to reach its present state, with which I am finally well pleased. An earlier draft was read by my son, almost (or recently) graduated from high school at the time, and without my knowledge by a friend of his who found it convincing in its portrayal of the secretive and often cruel world that children inhabit. In that context I must warn the reader that, while the story involves grade-school children, it is most definitely not a story for young children to read. Be warned, likewise, that if your reading tastes are especially delicate it might not be for you, either. Otherwise, I hope you will have a chance to interact with it. I would certainly welcome your responses. For official rules for the Nivalis contest, go to the Fabula Press website at this address: http://www.fabulapress.com/the-contest/. You may purchase the book, for yourself or for literary-minded family or friends, at http://www.amazon.com/Aestas-2014-Miscellaneous-authors/dp/1503233790/ref=sr_1_1?s=books&ie=UTF8&qid=1418429933&sr=1-1&keywords=Aestas+2014. The deadline for the current contest is February 28, and anyone at least 18 years old is eligible to enter; authors’ identities will again be hidden from the judges, so there should be no conflict of interests. In any case, please share this information with anyone you think might be interested in entering: the more entries, the merrier. On the subject of internationalism (and multiculturalism), I can’t help thinking that the single human quality most absent in today’s resurgence of racial conflict in the United States – not to mention countless other conflicts worldwide – is a sad lack of imagination, which is surely a crucial element of what enables us to imagine the world from others’ viewpoints and thus check our most dangerous assumptions. Hence one facet of the importance of literature and the other rhetorical and fine arts, including music and dance. This is one thing that terrifies me about the general thrust of educational reform these days, so narrowly focused as it has been on the hard sciences, mathematics, and most apparent and immediate needs of industry. Not that I have anything against those things, but I do object to the sidelining of the “softer” subjects without which we lose the most essential tools for evaluating, for instance, the ethics of business practice, economic and social policy, and the uses of science. “‘The standards must be made significantly fewer in number, significantly clearer in their meaning and relevance for college and work, and significantly higher in terms of mastery,’ they wrote. In reading, for example, they said schools should deemphasize literature and rely more on ‘informational texts’ – speeches, magazine articles, government reports. As Coleman would later put it, ‘It is rare in a working environment that someone says, “Johnson, I need a market anylysis by Friday, but before that, I need a compelling account of your childhood”’” (September/October, p. 38). I am not necessarily opposed to the imposition of a well-conceived and perhaps limited national common core; nor do I object to using the sort of texts Coleman and Zimba mention as an important part of students’ broad education; certainly that is better than the stereotypical first-day assignment of “How I Spent My Summer.” But I do object to the truncation, the cutting-off and narrowing, of the curriculum suggested by Coleman’s glib and uncomprehending dismissal of anything literary. I would venture to say that market analysis will not have much to say about how to live peacefully with people who are (or appear to be) substantially different from us. Jorge Luis Borges, the great Argentine literary stylist of the past century, liked to think of himself as a citizen of the world, not just of Argentina. Which is not to say that his literature was not profoundly Argentine. His nation’s history and the nuances of the different streets and neighborhoods of Buenos Aires run through all of his prose and poetry, but no more so than did the literatures and philosophical traditions of England and Germany, as well as of Sheherezade’s Arabian Nights and what we used to call the Orient. Likewise, while my own writing is infused with Argentina and Cervantes’s Spain, among other influences, it is ultimately grounded in these United States where I was born and grew up – and in my own state of Indiana. I have been blessed, to a greater extent than some and a lesser extent than others, to visit other places and rub shoulders with different people. But how many people have traveled just as richly, through literature and the other arts, without ever moving from the soil where they were born? This is a supremely practical value whose place in local or national curricula we eliminate or reduce at our own peril. Saint Paul, in the first book of Corinthians, I believe it is, speaks of the various gifts of the spirit, one of which is charity, which is of course closely linked to empathy, to human sympathy, to imagination sufficient to walk the proverbial mile in another’s shoes. And as represented by Jesus in his parable about the culturally despised and hated Samaritan – who nonetheless had greater sympathy for his supposed enemy than the “righteous” man or priest who passed by on the other side of the street – even those we have been taught to fear and hate. Some ground has been made recently, in this respect, in our society’s general acceptance of gays and lesbians, among other to-some-still-scary folk. But we seem to be slipping backward (not just here but in Europe and other places) in our tolerance of racial or national strangers among us: the marginal, the alien, the “illegal.” Granted, there is such a thing as an incorrigible terrorist or murderer, but we have them among ourselves and we should perhaps make as great an effort to understand them as to destroy or irradicate them. We can’t do that without an honest discussion of our own national misdeeds, a conversation that is neither treasonous nor unpatriotic in any true sense. If our object is to protect American lives, including soldiers’, then we owe it to ourselves and those soldiers to not continue down the same paths that have fed our enemies’ hatred. We like to think of ourselves as an exceptional and an inherently good people, but in fact our exceptionality is contingent on our goodness and we are, otherwise, just human like all other peoples: an unstable hodgepodge of good and bad impulses. We don’t like to think of ourselves as a bloodthirsty and vengeful people, for example, but if such we are, it would be useful information. I have been struggling with this theme since before I wrote my last essay-blog in September. Since then I have been reading Taylor Branch’s magisterial three-volume history of America in the Martin Luther King years, and I remain deeply troubled by certain parallels between then and now: from the now more veiled efforts to prevent scary black and brown folk from voting, to some white folks’ defensiveness in the face of almost daily police or vigilante shootings of African American males. Granted that white police officers are people just like all of us, white and brown and black, and we must try to understand their motivations and their humanity. Granted, also, that we are all partly responsible for these incidents by the ease with which politicians and demagogues have consistently managed to stir us up, from time to time, to an irrational and excessive thirst for law, order, and vengeance – human and Constitutional rights be damned. I suspect that, to some extent, the present crisis has as much to do with power as with prejudice, though at the same time we must every one of us examine the conscious and unconscious assumptions that feed the prejudices, also conscious and unconscious, that to varying degrees we all possess. Imagination, human sympathy, tolerance: these are all human qualities that can be cultivated if we open ourselves up to them. Not all of us will, there are always the hard cases who will refuse to be moved, but surely a working majority of us could pull it off if we really wanted to. It could do us a great good, individually and collectively, if we would consciously give ourselves over to the stories, the narratives, the songs and artistic expression, of the people we most fear in the wide world and at home. But with an open heart instead of an ideological checklist of why to not be “taken in” by them. But we have an immediate problem of evident police brutality that, along with our unresolved issues with “race” (a concept that biologists will tell us has no real validity), threaten to tear us further apart and to set us against each other. Some ten years ago, on a short journey back to Argentina which I first visited about a quarter of a century earlier, I spoke with María Rosa Lojo, the author of a couple of books that I have translated. She commented on movie and TV police dramas in which police are the good guys. In Argentina, she said, with their history of corrupt and militarized policing, and the generals’ not-so-distant “dirty war” against the country’s own people (more than 10,000 “disappeared” in the late 1970s and 80s, some of their bodies dropped from planes into the ocean), no such drama would sell for the simple reason that no one would believe it. Their antipathy is also rooted in 19th-century Argentine literature, in particular to a literary gaucho, one Martín Fierro, and other renegades whom the people would give shelter on the assumption that bad and oppressive governance had driven them to their transgressions. I fear that we may be heading for such a fate in the United States. 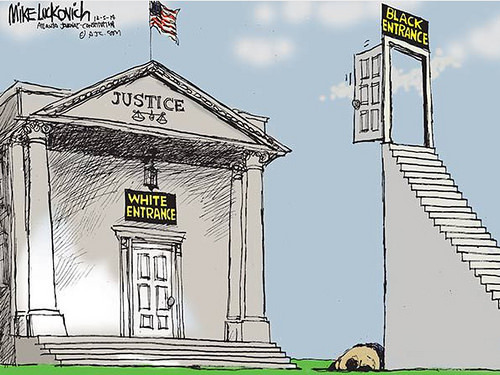 In some African American communities, perhaps we are already there or already arriving. I have seen enough outrageous videos lately to make me seriously question, at the very least, if all of my countrymen and women can really expect justice from their local police force. Can we act for substantive change while it’s not too late to reverse things? Both reality and perception? I’m not sure, but we must hope. And both our hope and our knowledge must inform our actions. This entry was posted in Uncategorized and tagged Aestas, Alison Miller, America in the Martin Luther King years, Anirban Choudhury, Anisha Bhaduri, Argentine Dirty War, Argentine literature, Brett Alan Sanders, common core movement, Fabula Press, Imagination and human empathy, internationalism and multiculturalism, Jorge Luis Borges, Katie Avagliano, Martin Fierro, Mother Jones, Nivalis, Oliver Snelgrove, police brutality, Taylor Branch, U.S. race problem, Wilson Engel III, writing contests. Bookmark the permalink.